This is a First Aid training student’s pictures of his own experience with a Brown Recluse Spider bite. Think Safe provides First Aid training courses! Online, in-person, and blended options are available. Click here to visit our training page! If you would like more information on First Aid or CPR training, please complete the following form and we’ll promptly contact you! SUDDEN CARDIAC ARREST is the #1 killer in the US annually and an Automated External Defibrillator (AED) is the difference between life and death for these victims. Every minute that goes by without using an AED results in a 10% less chance of survival! You simply can’t wait for EMS or First Responder community teams to arrive! National average EMS response is 8-10 minutes in urban areas. 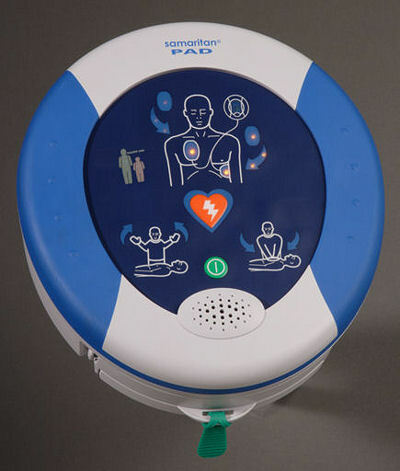 OSHA highly recommends these devices in the workplace and there are many industry-specific, federal, state and local mandates for AEDs due to the death toll of Sudden Cardiac Arrest (SCA). But, even if you are not mandated — you should consider purchasing one of these devices. They take survival rates from SCA from 3-7% to over 65%! PLUS, if you can use a cell phone – YOU CAN USE AN AED! So, are there any drawbacks to owning an AED? Yes, if you do not maintain them or implement them according to your applicable AED acquirer laws in your city/county/state. Think Safe knows these laws and is known for providing the legal protection and solutions our clients and dealers need. Think Safe, in an effort to help our customers and dealers understand the legalities of defibrillator ownership, is sponsoring a webinar series on AED Programs: Avoiding Liability. The webinar runs 3 times per day in March with speakers Paula Wickham or Greg Stebral, industry experts, providing key tips and resource materials for existing AED programs or those interested in selling AEDs or purchasing AEDs for their facility or workplace. Once you fill out the form (we DO NOT SELL your information) you will be provided a screen that shows open webinars and you can click on and select any times / dates with open seats. There are many dates/times to pick from this month- we know how hard it is to push a webinar into your busy schedule but…. you’ll find value from this webinar and we look forward to seeing you online. If you have any questions or want to schedule a specific time for this webinar please contact Paula Wickham at pwickham@think-safe.com or call our offices and ask for Paula or Greg, 319-377-5125. Making Minutes Matter! If you’d like us to contact you, please complete the following form. We are happy to assist you! You are currently browsing the archives for the safety tips category.